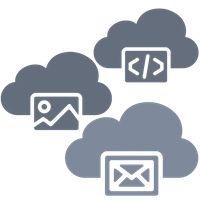 We support the OpenAPI Initiative and can connect and orchestrate any API that is documented in that format. You provide the URL for the API specifications to use. We import and maintain links on your behalf. You design flows weaving your cloud functions and APIs together using our visual designer. Slack is our main communication hub, so it's more efficient to stay put and extend it through Slackbots. We type a command and get results without ever leaving Slack, searching sites like the New York Times right in line. Slack makes it easy to get started. You specify the command (/nytimes) and a handler URL. 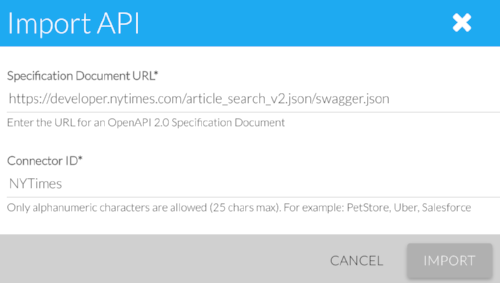 The New York Times publishes their API spec in the Open API format. The import process only takes a second and allows the API and its operations to be orchestrated using the Intwixt visual designer. 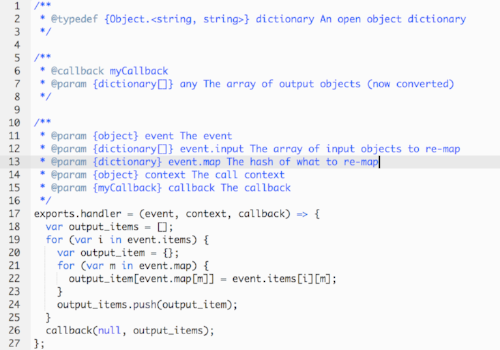 The New York Times response uses the field names, snippet and web_url. Slack uses title and title_link, so we wrote a generic Lambda function to modify field names. Intwixt supports one-click integration with Lambda and will parse the JSDocs to auto-generate the function signature and all supporting APIs. The final step is to bring it together using the Intwixt designer. Intwixt provides an HTTP Trigger that listens for the Slackbot query. The query is then sent to the New York Times after which the response is sent to the Lambda function. Once converted to the proper format, the final output is returned to Slack. We're big believers in APIs. Not only do we let you import any API, every flow you author is backed by APIs as well. We document all HTTP endpoints on your behalf and expose these as an Open API specification. It's APIs all the way down.